On a rise just above the croft of Smiddyford is the ruin of the farm Auchavaich. If you look at the map above of the 1850’s you can see the outline of structures still visible today. At the top of the site is a building possibly the farm cottage. To the side of it is a pond which supplies water via a covert duct to a building lowered down possibly a type of mill. In the middle is an enclosure with an ‘L’ shaped building at the foot possibly the barn. In front of this building appears to be a garden. To the right of the pond and not marked on the map is the outline of a possibly older building. The remains of this building are situated in improved pasture and measure 12.6m from NW to SE by 5m transversely over grass-grown stone wall-footings 0.9m in thickness and up to 0.4m in height. There is an entrance in the SW side, and a small enclosure adjacent to the NW end. The building is depicted as unroofed on the first edition of the OS 6-inch map (Aberdeenshire, sheet l, 1869). Visited by RCAHMS (JRS, ATW), 14 May 1997. Nothing is visible of this building, which stood in what is now rough pasture about 560m NNW of Beltimb farmsteading (NJ31NE 4.00). 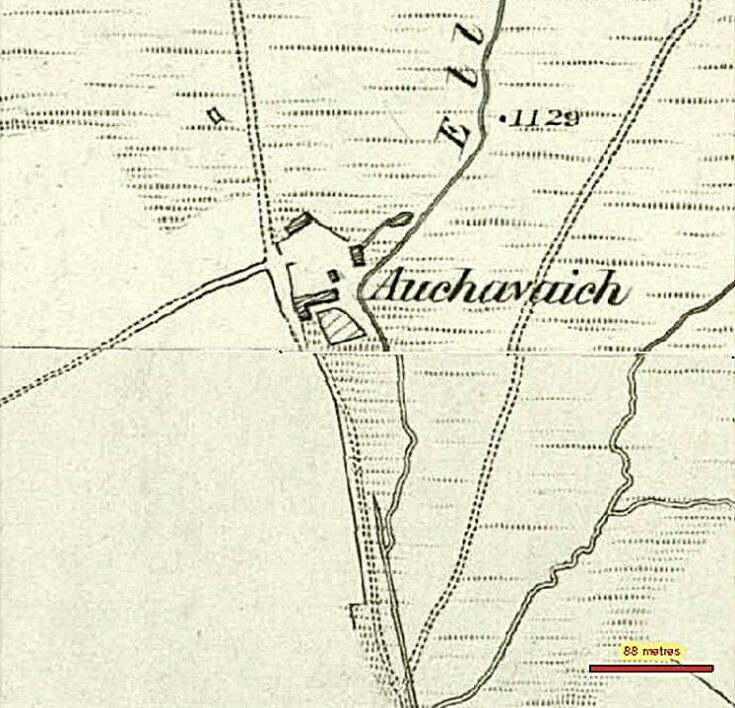 The building is depicted unroofed on the 1st edition of the OS 6-inch map (Aberdeenshire, 1869, sheet L), but it appears to have been removed before the end of the 19th century and is not shown on the 2nd edition of the map (1903, sheet L). Visited by RCAHMS (JRS), 21 October 1997. A single unroofed building is depicted on the 1st edition of the OS 6-inch map (Aberdeenshire 1869, sheet l), but it is not shown on the current edition of the OS 1:10000 map (1975). George Gauld(son of William Gauld 1) b. 12 Feb 1871, emigrated to British Columbia Canada in the early 1890's. George died in Williams Lake British Columbia on 15 Jan 1951. His brother Archibald Reid Gauld and sister Isobel Gauld emigrated about the same time. Archibald traveled north in 1898 and was part of the famous Klondike Gold Rush in the Yukon Territory of Canada. He died 28 Oct 1943 in Vancouver BC. Their sister Isobel married and raised 10 children in the BC interior and died there in 1949. Their brother, William Gauld (1858-1933) was my great grandfather.